peroxyl, that when it’s reduced forms hydroxiperoxyle its decomposition forms MDA and 4-hidroxialquenal. safe, free of toxic effects and low cost. medicine is used as an active substance or drug [4-7]. with development, income and younger patients [30,31]. ments used by cancer pat ients in 2 6 stages in 13 countries. vealed by their scientific communications  Figure 2.
the greatest number of research projects at different institutes, research centers and universities. difference in their scientific production plants significantly lower. 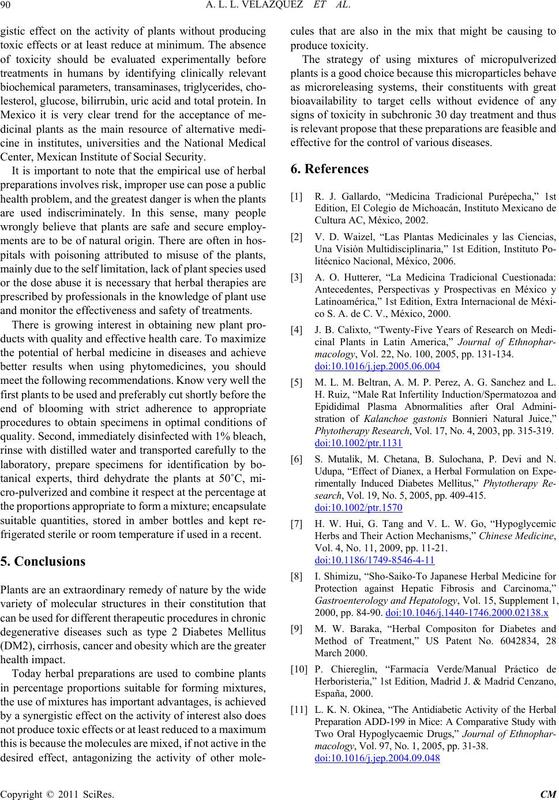 A. L. L. VELAZQUEZ ET AL. conventional medicine has reached its limit . and monitor the effectiveness and safety of treatments. DM2, fibrosis/cirrhosis, cancer, arthritis and obesity . even cure with allopathic treatments. other tissues involved in disease. with 2 of 8 cases. effective for the control of various diseases. toxic effects and low cost. thus able to advise their patients on the use of this plants. 91.15%) of free radicals [43,44]. triglycerides, lipoproteins, bilirubin, protein and albu min. Figure 3. 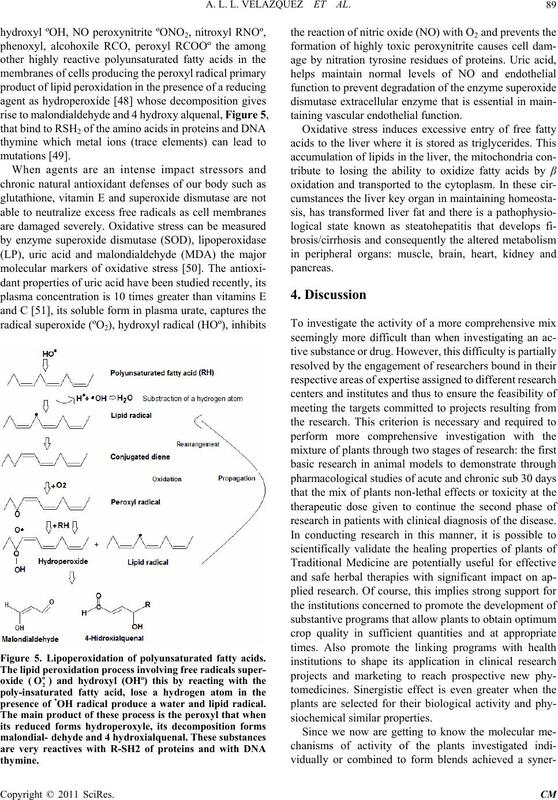 Hepatoprotective and antioxidant molecules from plants. of glucose absorption from the intestine . in rats poisoned with carbon tetrachloride . Figure 5. 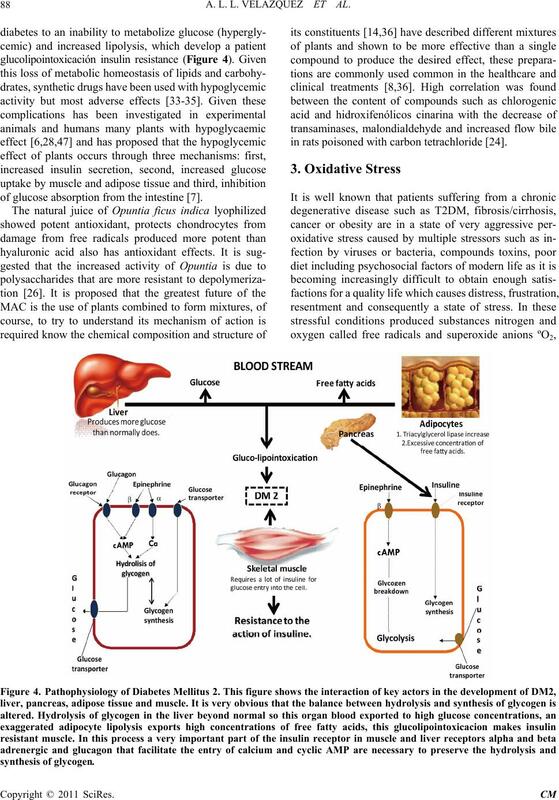 Lipoperoxidation of polyunsaturated fatty acids. presence of •OH radical produce a water and lipid radical. taining vascular en dothelial function. research in patients with clinical diagnosis of the disease. Center, Mexican Institute of Social Security. frigerated sterile or room temperature if used in a recent. co S. A. de C. V., México, 2000.
macology, Vol. 22, No. 100, 2005, pp. 131-134. 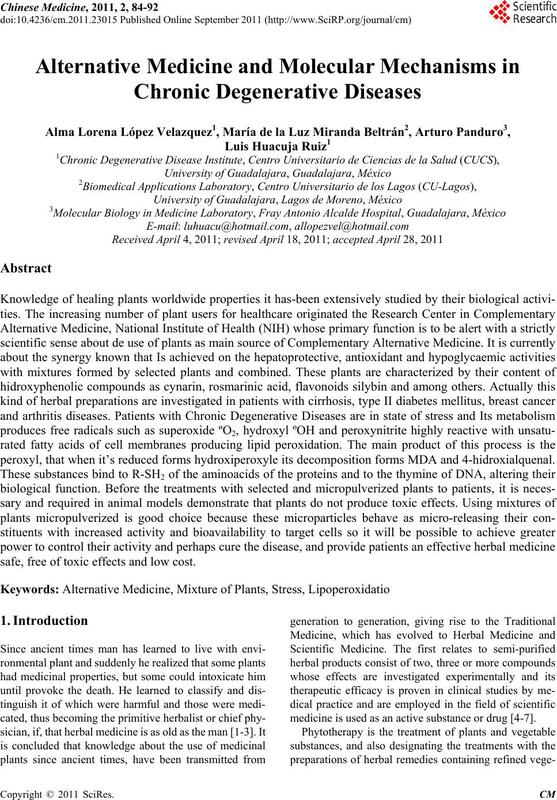 M. L. M. Beltran, A. M. P. Perez, A. G. Sanchez and L.
Phytotherapy Research, Vol. 17, No. 4, 2003, pp. 315-319. S. Mutalik, M. Chetana, B. Sulochana, P. Devi and N.
search, Vol. 19, No. 5, 2005, pp. 409-415. Vol. 4, No. 11, 2009, pp. 11-21.
macology, Vol. 97, No. 1, 2005, pp. 31-38. R. L. Huacuja, V. A. L. López, A. Panduro, P.
Hepatitis Airal B Crónica,” Investigación en Salud, Vol. 9, No. 3, 2007, pp. 190-197. R.-L. Huang, Y.-L. Huang, J.-C. Ou, C.-C. Chen, F.-L. Supplement 2, 2000, pp. E61-E66. Applied Microbiology, Vol. 28, No. 4, 1999, pp. 291-296. 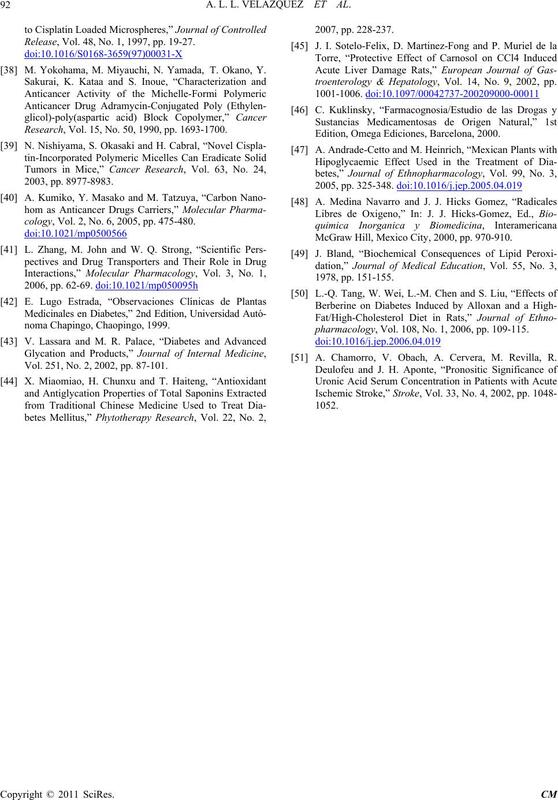 Journal of Ethnopharmacology, Vol. 73, No. 1-2, 2000, pp. M. K. Canales and B. M. Ge ller, “Surviving Breast Cancer. Health, Vol. 26, No. 1, 2003, pp. 11-24.
ern Turkey,” Cancer Nursing, Vol. 26, No. 3, 2003, pp. B. M. L. Miranda, R. L. Huacuja, V. A. L. López and A.
del Hígado,” Investigación en Salud, Vol. 7, 2005, pp. cal in Liver Disease, Vol. 5, No. 2, 2001, pp. 461-468. Ethnopharmacology, Vol. 100, No. 1-2, 2005, pp. 61-66. 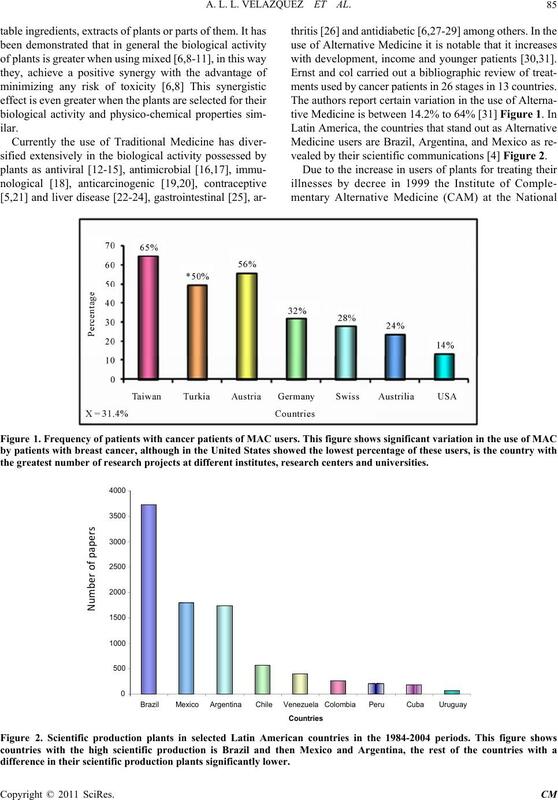 Cultures,” Journal of Ethnopharmacology, Vol. 111, No. H.-P. Guan, Y. Li, M. V. Jensen, C. B. Newgard, C. M.
Medicine, Vol. 8, No. 10, 2002, pp. 1122-1128. Ethnopharmacology, Vol. 94, No. 1, 2004, pp. 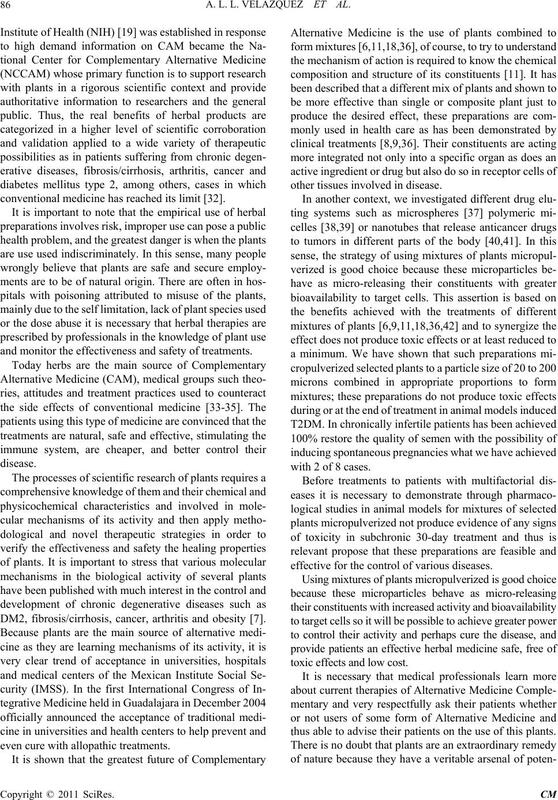 1-21.
betics Rats,” Journal of Ethnopharmacology, Vol. 79, No. dical Journal, Vol. 309, 1994, pp. 86-89.
matic Review,” Cancer, Vol. 8, No. 4, 1998, pp. 10-15.
rican Medical Association, Vol. 287, No. 3, 2002, pp. bolism, Vol. 14, No. 4, 2003, pp. 169-175. L. D. May, J. H. Leftorowitch M. T. Kram and D. E.
Vol. 136, No. 6, 2002, pp. 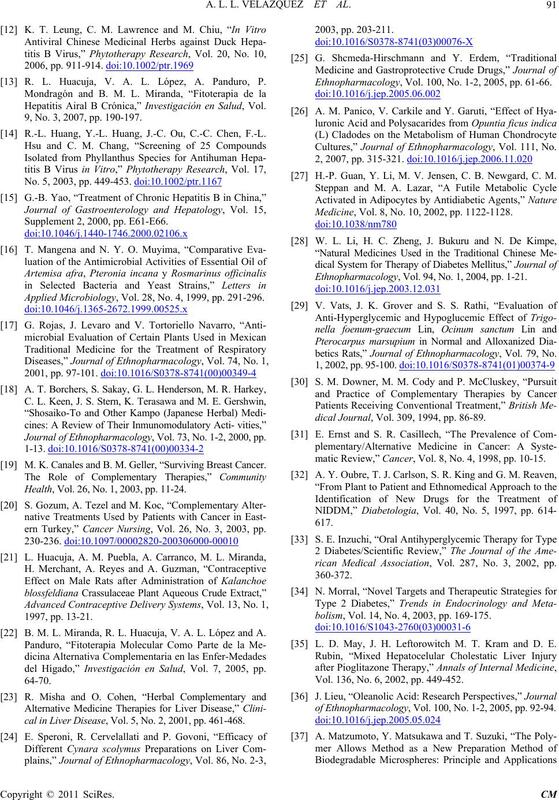 449-452.
of Ethnopharmacology, Vol. 100, No. 1-2, 2005, pp. 92-94. Release, Vol. 48, No. 1, 1997, pp. 19-27. M. Yokohama, M. Miyauchi, N. Yamada, T. Okano, Y. Research, Vol. 15, No. 50, 1990, pp. 1693-1700.
cology, Vol. 2, No. 6, 2005, pp. 475-480. Vol. 251, No. 2, 2002, pp. 87-101.
troenterology & Hepatology, Vol. 14, No. 9, 2002, pp. Edition, Omega Ediciones, Barcelona, 2000. McGraw Hill, Mexico City, 2000, pp. 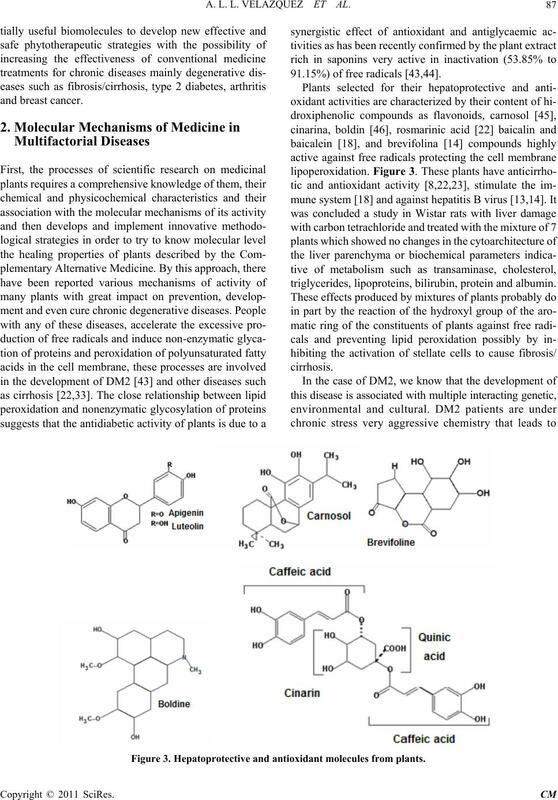 970-910.
pharmacology, Vol. 108, No. 1, 2006, pp. 109-115. A. Chamorro, V. Obach, A. Cervera, M. Revilla, R.